The Estes Park Advanced Propulsion Workshop, 20-22 September 2016, organized by the Space Studies Institute (SSI), will feature presentations by NASA Eagleworks scientist Paul March and Prof. Martin Tajmar, chair for Space Systems at the Dresden University of Technology, who last year presented an independent confirmation of the anomalous EmDrive thrust. Other notable participants include Prof. James Woodward and Prof. Heidi Fearn, both from California State University, Fullerton, and Prof. David Hyland from Texas A and M University. The 3-day conference will address at most 6 concepts for a breakthrough in propulsion. They are devoting a half-day per concept. The half-day is broken into theory and experiment sessions for the concept. The concept will be investigated on both grounds, with substantial give-and-take between the audience and the concept presenter, verbally and on the whiteboard. The theory session will allow us to understand how the concept departs from existing theory of general relativity or electrodynamics. However, we are willing to entertain concepts with compelling experimental demonstrations for which there is yet no solid theory. The experiment session will allow us to understand how to experimentally verify the concept, and the mechanism by which it could solve either the fuel or time-distance problems. However, we are willing to entertain concepts with compelling theoretical aspects well-rooted in known physics, for which concrete experiments could be contemplated. They will moderate a disciplined and respectful interchange, working toward a goal of common understanding, while still “kicking all the tires” of rigorous peer-review. 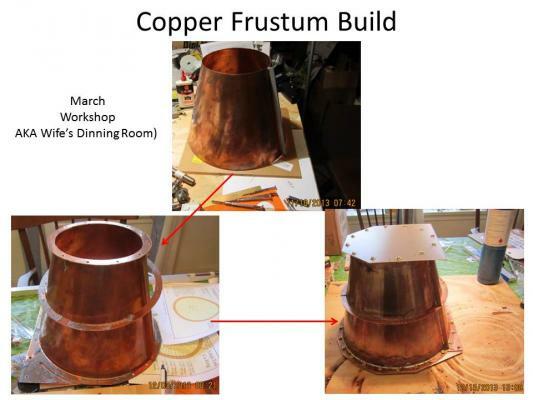 Paul March also endorsed the technical information and insights of forum member Rodal on the topic of EMdrive. Rodal indicates the differences in dielectric materials and other nuances of interpreting the known results. A radio frequency (RF) resonant cavity thruster is a proposed new type of electromagnetic thruster. Unlike conventional electromagnetic thrusters, a resonant cavity thruster would use no reaction mass, and emit no directional radiation. A few variations on such thrusters have been proposed. Aerospace engineer Roger Shawyer designed the EmDrive in 2001, and has persistently promoted the idea since then through his company, Satellite Propulsion Research. Chemical engineer Guido Fetta designed the Cannae Drive, based on similar principles. If they are found to work as claimed, providing thrust without consuming a propellant would have important applications to all areas of propulsion. Some independent teams of scientists, notably a team at Xi’an’s Northwestern Polytechnical University (NWPU), one at NASA’s Eagleworks laboratories, and another at the Dresden University of Technology in Germany, have built prototypes of these designs. The NWPU team reported a small but significant thrust; NASA Eagleworks reported a much smaller thrust than the NWPU team; and the Dresden team reported a small thrust, but within experimental error. In 2014 and 2015, the NASA Eagleworks research group at Johnson Space Center tested models of both the EmDrive and Cannae drive. They reported observing a small net thrust from both, at low power levels. NASA’s first tests of this tapered RF resonant cavity were conducted at very low power (2% of Shawyer’s 2002 experiment and 0.7% of the Chinese 2010 experiment), but a net mean thrust over five runs was measured at 91.2 µN at 17 W of input power. A net peak thrust was recorded at 116 µN (about 0.0004 ounces, or approximately the same weight as a grain of rice) at the same power level. The experiment was criticized for not having been conducted under vacuum, which would have eliminated thermal air currents. 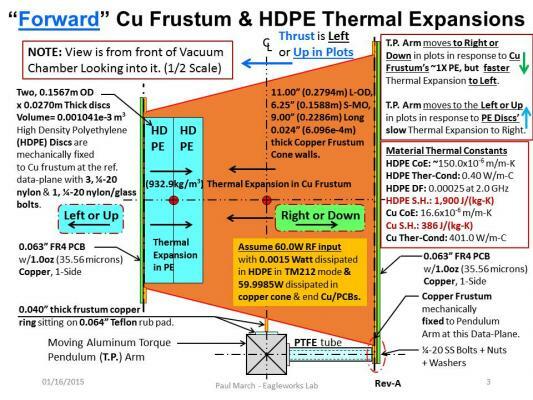 Six months later, early 2015, Paul March from Eagleworks made new results public, claiming positive experimental force measurements with a torsional pendulum in a hard vacuum: about 50 µN with 50 W of input power at 5.0×10^−6 torr, and new null-thrust tests. The new RF power amplifiers were said to be made for hard vacuum, but still fail rapidly due to internal corona discharges, with not enough funding to replace or upgrade them, so measurements are still scarce and need improvement before a new report can be published. Glenn Research Center offered to replicate the experiment in a hard vacuum if Eagleworks manages to reach 100 µN of thrust, because the GRC thrust stand cannot measure forces lower than 50 µN. Paul March provides updates on the EMdrive and Cannae drive experiments at Eagleworks NASA. If one envisions the quantum vacuum (Q-V) as a semi-virtual electrical plasma as Dr. White does, that would imply that the Poynting power flow vector would entrain the Q-V plasma and send it on its way toward the pillbox end of the cavity and then out of the cavity, the back-reaction on the cavity should be in the opposite direction towards the RF feed end of the Cannae test article, but the observed thrust vector is opposite to that surmise, i.e. 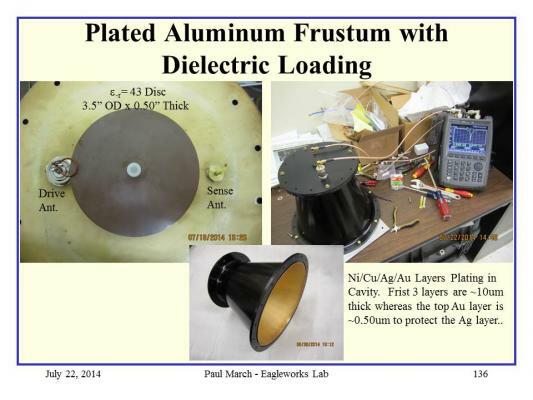 toward the shorter RF sense antenna end of the cavity per the attached slide. Next, using this new Q-V plasma simulation tool that utilizes the instantaneous E&M fields from COMSOL for one complete RF cycle in 5 degree increments as its input file, we are now seeing why we need the PTFE or HDPE dielectrics in the frustum while using near pure sine wave power levels below ~100W in the ~2.0 GHz frequency range to generate detectable thrust, and why Shawyer and the Chinese didn’t while pumping 80W to 2,500W using magnetron RF sources. We think the reasons are two fold. Due to the above non-linear thrust scaling with input power predictions, we have started the build up of a 100W-to-1,200W waveguide magnetron RF power system that will drive one of our aluminum RF frustum cavities. Initially the test rig will follow Shawyer’s first generation test rig that used a tetter-totter balance system in air only to see if we can generate similar thrust levels that Shawyer reported using a hermetic sealed box, which were in the ~16 to 300 milli-Newton range dependent on the Q-Factor of the frustum. – Shawyer experiments in ambient air (as well as newer superconducting designs) are now kept under a shroud of secrecy. – Chinese mid-to-high power experimental results (~ 2000 W) in ambient air are on the contrary regularly published in academic journals, but are still uncertain because Pr. Juan Yang is not able to share additional data, and spurious causes like air currents are not ruled-out. There is information from Paul March on the testing of the controversial EMDrive at NASA Eagleworks. Paul commented on the NASA spaceflight forum.